Pittsburgh forward Evgeni Malkin gets into his second fight of the playoffs in a match against Boston. The Pittsburgh forward Evgeni Malkin got into a fight with the Boston player Patrice Bergeron in the first match in the Stanley Cup semifinal. The Penguins were playing the Bruins at home, and, after the second period, the Russian forward unexpectedly clashed with his opponent. After a fairly brief but emotional battle, Evgeni, as they say, won on points. When both men were sent off the ice, Bergeron’s sweater was covered in blood. Malkin inflicted most of the damage on his opponent with his glove, right at the start of the scuffle. “I saw this incident, but didn’t want to pay too much attention to Malkin’s purely technical actions during the fight,” Andrei Nazarov, head coach of the Kontinental Hockey League’s Donbass club, told RBTH. Andrei Nazarov knows a thing or two on the matter. When playing for the San Jose Sharks and other NHL clubs in the 1990s, he gained a reputation as one of the best tough guys in the league. These days, the Chekhov club Vityaz (under Nazarov’s leadership) has become the toughest team in the KHL. Unfortunately for the Pittsburgh fans, Malkin’s efforts were not enough to secure victory – in the first game of the semifinal, Boston won 3:0, making a substantial claim to success in the series. This was the second fight for the Russian star during the NHL playoffs. In the fourth game against the New York Islanders, Malkin got into a fight with defenseman Travis Hamonic. Incidentally, the Penguins also lost that game; although, in the subsequent matches, they demolished the Islanders’ defense. 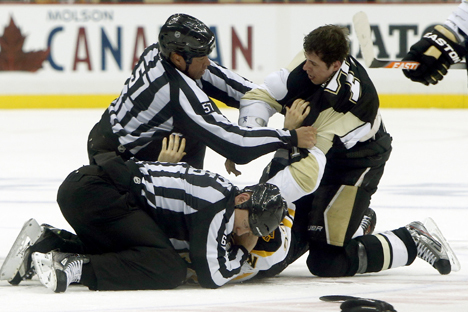 Even so, Evgeni “Geno” Malkin has not often been involved in fights. During his career in the NHL, Geno has had two other fights on the ice: in 2009, with Henrik Zetterberg of Detroit in the Stanley Cup final, and, in 2010, in an exhibition match with Columbus leader Rick Nash. Malkin’s most famous scuffle, however, was a fight narrowly avoided with another Russian star – with Alexander Ovechkin of Washington. In one of the regular NHL matches, an emotional brawl broke out between them, but it did not get as far as real sparring. After this, the conflict went into a protracted phase: The two players and their representatives exchanged stinging remarks via the press. Geno and Ovi only managed to patch things up a couple of years ago, when they were both in the Russia team camp.